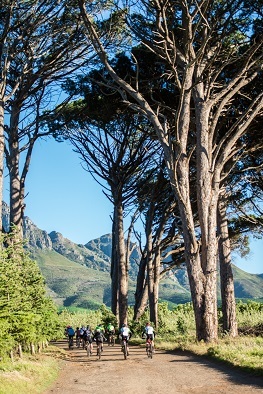 The FNB Wines2Whales Adventure kicked off at Lourensford Wine Estate on Friday, October 31. Teams of two took on a 72km route that included travelling over the Gantouw Pass before reaching the finish line at Oak Valley Wine Estate. Team Uystervis’ Charel Uys and Rikus Visser took the win in the men’s category in a time of 4 hours, 1 minute and 9 seconds. “Today was tough,” said Uys. “We rode really hard on the climbs. Rikus was much stronger than me. The stage was very nice and we really enjoyed the single track, especially towards the end. Our plan for stage two is just to take it as it comes”. Team RBS’ Theresa Ralph and Michael Petersen claimed victory in the mixed category in a time of 4 hours, 27 minutes and 39 seconds. “This is my first FNB W2W MTB Event,” says Ralph. “It’s nice to be able to check out the trails and look at the view for a change. I won’t get to do much of that at the Race. The route was stunning, featuring amazing views and wow single track. It’s a world class Cape Town event,” says Ralph.